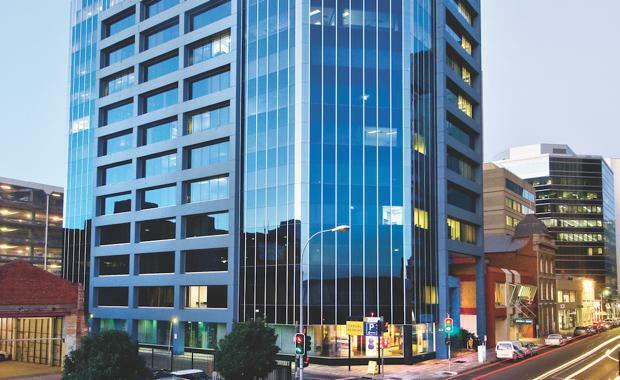 A private investor has snapped up an Adelaide office building for $73 million in the biggest individual property transaction in South Australia this year. Colliers International's Paul van Reesema, Ian Thomas and Alistair Mackie have negotiated the off-market sale of 100 Waymouth Street to a private Singaporean investor on behalf of Cromwell Property Group. "This sale is the biggest transaction in the Adelaide market this year and represents a market leading yield of 6.775%," Mr van Reesema said. "The capital value of $5,932/sqm is also a record rate for a building of this kind in Adelaide. "100 Waymouth Street is a fully refurbished, 13-level A Grade building originally constructed in around 1990. Upgrade works completed in 2013 included a new foyer, new lifts, new air conditioning plant, double glazing, new ceilings and T5 lighting, fully upgraded BMS and full refurbished amenities. The building refurbishment was designed to achieve a 4.5 Star NABERS Energy Rating and a 4.5 Star NABERS Water Rating. The 12,305sqm building is now fully leased, having attracted high profile corporate tenants in Origin Energy and Community CPS Credit Union on long term leases. "Located in Adelaide's vibrant west end business precinct, 100 Waymouth Street is surrounded by prestigious neighbouring buildings including Adelaide's tallest office tower, Westpac House, as well as News Corporation's Head Office at ANZ House, the new ATO Tower at EY House and The Rendezvous Hotel," Mr van Reesema said. Mr Thomas said the precinct had undergone significant transformation in recent years, with the emergence of fashionable new licenced venues and wine bars in the surrounding side streets including Leigh, Peel and Gilbert Streets. "These streets form part of the various pedestrian thoroughfares that help link the Adelaide Train Station and the new Adelaide Oval to the western section of the CBD," he said. "100 Waymouth Street is within easy walking distance of the Central Markets, the cafes and restaurants of Gouger Street and Chinatown, world class shopping of Rundle Mall and the cultural and entertainment venues on North Terrace. These is also an abundance of public transport and parking in the area. "These factors combined to make 100 Waymouth Street an exciting and enticing investment opportunity."